Sundarananda possessed great mystic powers. He made kadamba flowers bloom on a lime tree, which he later used in the service of Radha-Raman, as is stated in the Vaiṣṇava-vandanā. purā sudāma-nāmāsīd adya sundara-ṭhakkuraḥSundarananda Ṭhākura was previously one of the twelve Gopals known as Sudama. (Gaura-gaṇoddeśa-dīpikā 127)Sundarananda, a true servant is counted amongst the branches of Nityananda Prabhu. Nityananda Prabhu joked with him in the Vrindavan mood. (Chaitanya Charitamrita 1.11.23)Sundarananda is an ocean of sacred rapture. He is chief amongst the associates of Nityananda Prabhu. His home was in the village of Maheshpur in Jessore district. Maheshpur stands on the Betravati River, fourteen miles east of the Mazdia railway station. Only his place of birth remains there at present. 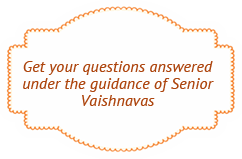 His deities were named Sri Radha-Vallabha and Sri Radha-Raman. Their priests later moved these deities to Sayyidabad and later wooden deity was installed in Maheshpur. Sundarananda never married and thus has no descendants. Descendants of his disciples continue to maintain the site in Maheshpur. Some of his relatives live in Maṅgaladihi in Birbhum district. In great hope, I worship Sundarananda Ṭhākura who made a kadamba flower bloom on a lime tree. On another occasion he dove into a river and pulled a crocodile out. 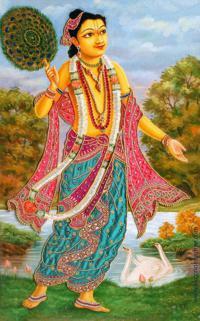 He resembled Nityananda Prabhu in being a savior of the most fallen. His disappearance took place on the full moon day of Karttik month.